This final chapter in the fun and steamy New Adult trilogy by Noelle August (authors Veronica Rossi and Lorin Oberweger) features two aspiring musicians who must choose between their careers…and their sizzling attraction for each other. I would have to say Noelle August writing team are definitely go to books for me when it comes to new adult romance. Bounce does not disappoint and I feel sad it’s the last book in the trilogy. I kept thinking about what characters they could write the next book about and then was like oh I think this is the last book. Do book series have encores?? I definitely would be yelling encore for this. I have loved the characters in this series thus far and I’m always thinking I couldn’t love another couple more than the one I’m currently reading. Then I fall in love all over again. I loved Sky and Grey, especially Grey. I’m so glad that Grey gets the chance to show everyone what he can be. Skylar and Grey have chemistry and she knows it but she also seems him as being a bit immature and a musician. Now the thing about Sky is that her dad is kind of a deadbeat. He’s in a band and takes off at the drop of a hat. Leaving her mom and her family high and dry until he doesn’t to come back again. So you can see why Brooks, someone who has it together, has a plan for his life is more appealing to her. It’s not always about chemistry when you are looking down that long dusty road. So I could see her dilemma with not wanting to jump into anything Grey. Grey is so sweet and adorable it’s hard not to love him. Although he does what Sky says and smashes and avoids. Everytime he ran away from problem I would get frustrated with him but it was so easy to forgive him. He would do something fun or cute for Sky and you would have to like him all over again. Plus you can tell he is the type of guy who doesn’t take a good relationship lightly. Out of the two main characters he is definitely the one that grows up the most. As always great side characters. Titus and Beth and of course Garrett were my favs. Of course there is Brooks as well. How can Brooks not be the encore. come on. The plot is great and revolves around a movie set which is different than the office setting of Boomerang. Gives them more to play with in a way. The thing I also enjoy is that the books all feel different. I loved this addition to the series. I’m sad to say the series is supposed to be ending with this book. encore...maybe if I write that enough it will become true. Just a fantastic feel good romance that I think you should read. Question: What do you get when friends pen a story with heart, plenty of laughs, and toe-curling kissing scenes? Answer: Noelle August, the pseudonym for renowned editor and award-winning writer Lorin Oberweger and New York Times bestselling YA author Veronica Rossi, the masterminds behind the Boomerang series. You can visit them at NoelleAugust.com, @Noelle_August, and facebook.com/NoelleAugustBooks. Don't miss the first two in the series! 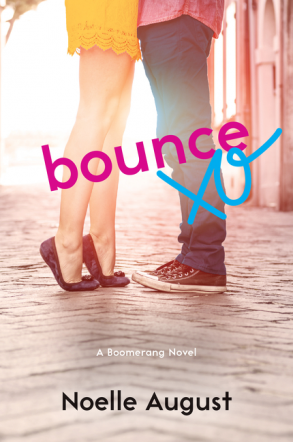 Boomerang and Rebound. I didn't realize it took place on a movie set - interesting!